If I look back on the past seven days in terms of formal workouts and running mileage, it might seem like a low production week. My weekly workout schedule is, at best, a compromise, but I still aim to do at least three runs a week, plus an elliptical session. 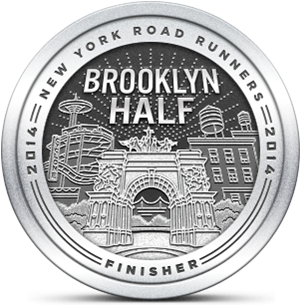 Occasionally strong weekly efforts come from different places and that was the case this week. We awoke on Saturday to a substantial amount of snow and 20-plus MPH winds. I watched the local news at 6:00 AM in between storm related cable outages. I realized that we'd only just begun. 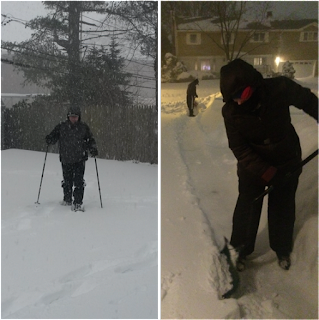 Instead of doing my usual Saturday morning run, the Emerging Runner family was out shoveling the first 5" of what ended up to be 23 inches of total accumulation. Our driveway gets much more snow than our neighbors, because of the unique way the wind channels through. The drifts added another foot of snow to our driveway in spots. The winds were unrelenting and there was a layer of ice underfoot. I was able to stay on my feet and move what I've calculated to be 1.4 cubic tons of snow. Mrs. Emerging Runner probably moved even more than that, because I spent some time in the snow not shoveling at all. I should say near the top of the snow, in my new Tubbs snowshoes. My wife gave me snowshoes in October for our anniversary, but this was the first time I'd had a chance to try them. After getting my Timberlands securely locked into the bindings, I bravely set out for a backyard adventure. 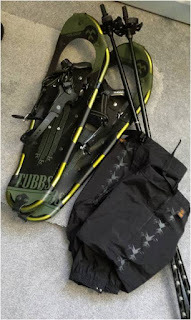 The snowshoe kit included trekking poles that were helpful and gaiters that kept my boots dry. I stepped out onto the deck and sank about three inches into what was, at the time, about a 10" accumulation. I trekked around the yard trying to understand if the snowshoes we providing a big benefit over snow boots. Sinking only a third of the way down was better than post-holing. In some spots, where the snow was less packed, it was easy to see how the snowshoes helped. By the time I finished, the entire backyard was covered with my tracks. I discovered that it was easier to move over the areas where I'd already trekked, because that snow was compressed. I tried to run with them, but it was akin to running on sand. I think I'll do better with denser snow. This morning we went out for our fifth round of shoveling and faced some big drifts. Once again, there was a wall of snow that the town plows deposited across the end of our driveway. We made short order of that and were happy to see the end of the blizzard. I have my methods to minimize wasted effort when moving snow, but it still ends up being a lot of upper body work. I really needed to give that half of my body some attention, but I thought it would also be a good idea to run a few miles indoors. I headed upstairs and fired up the treadmill. After watching the news people desperately trying to fill air time talking about the snowstorm, I decided to shut off the TV. Although I missed one of my running days yesterday, I feel like I put in the equivalent amount of effort (or more) throughout the weekend. My goal this week is to get back to routine with at least three runs - possibly four if I switch my elliptical workout with another run. 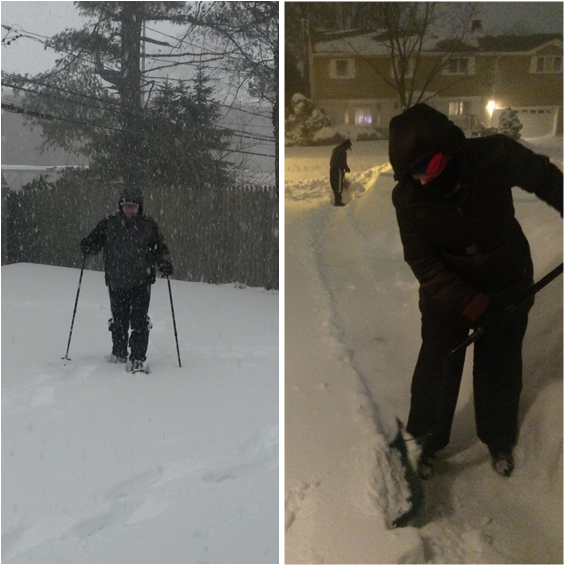 It was hard work shoveling this weekend, but the effort was well worth it. I'm really looking forward to getting out on my snowshoes again under more snowshoe-friendly conditions. That's so funny that you compared it to sand. When I was forced onto the streets today, those were my thoughts exactly. The effort felt tripled in the slushy snow. I think you should scrap the elliptical for running miles since you didn't ask. Also, me of little upper body strength, has been doing dumbbell exercises 3-4 times a week for the past couple of weeks and I can already see results. In case you were wondering. Thanks for answering all the questions that I didn't have. I know I should do some treadmill sessions instead of always using the elliptical during the week. I may start doing that even though I don't have a white hot hatred for the elliptical like you. What's you dumbbell routine? Are you switching off between upper and lower body days? Are you going to charge me for answering these questions now that you are a certified coach? Anterior, middle, and posterior extended arm raises; chair dips; and bicep curls.